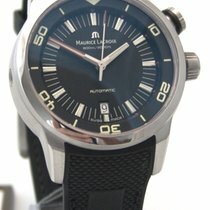 The luxury brand Maurice Lacroix is characterized by their classic, mechanical watches. However, this independent Swiss manufacturer offers much, much more than that, including sport watches and an extensive collection of women's watches. Maurice Lacroix's Masterpiece and Les Classiques series are perfect for watch enthusiasts with a passion for complicated movements and traditional designs. 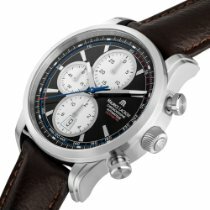 They also offer the complete opposite in the form of their Pontos collection, which is full of sporty chronographs. Maurice Lacroix prefers to use stainless steel for their cases. The company also stands out as one of the few manufacturers that can claim to make their own cases, as the company Queloz SA has belonged to the concern since 1989.. The Masterpiece series features watches with classic designs and the newest technology. The Masterpiece Gravity model is the first wristwatch to have an escapement made entirely of silicon. Maurice Lacroix presented this watch for the first time at the Baselworld watch and jewelry show in 2014. Silicon is a highly durable metalloid that requires almost no lubrication and is unaffected by magnetism and temperature changes. Due to these advantages, silicon is being used more and more in high-quality watches. Breguet is another Swiss manufacturer who was an early adopter of silicon technology. The Masterpiece Gravity is powered by the in-house caliber ML230. Its dial is partly skeletonized and leaves the escapement visible so the wearer can watch the parts move as they work. The time (hours and minutes) is displayed on a larger dial at the two o'clock position, while the seconds are displayed on a smaller subdial below. Other Masterpiece models are completely skeletonized and have no dial, resulting in a fully visible movement. You can also find watches with valuable complications in this collection, such as a world time function, moon phase indicator, or power reserve indicator. These additional functions are available in the Worldtimer, Phases de Lune, and Réserve de Marche models in the Masterpiece collection. Blued or golden hands, silver dials, and Roman numerals emphasize the traditional look of these watches. Maurice Lacroix uses gold cases in the Les Classiques series as well; the Les Classiques Date Gold even features an 18-karat pink gold case. This watch is timelessly chic thanks to its stick indices and thin, pink gold coated hands. Its date display is located at the three o'clock position, but otherwise, the Date Gold remains simple and streamlined. The watch is also available completely in stainless steel or in a bicolor version featuring contrasting pink gold and stainless steel. The automatic caliber ML55, with 28,800 alternations per hour (4 Hz) and a 38-hour power reserve, runs in every 38-mm diameter watch. More complicated versions of the Les Classiques feature chronograph functions and moon phase indicators. The Phase de Lune chronograph has both complications and still manages to remain a subtle 41 mm in diameter. The chronograph movement ML112 is the bridge between the Les Classiques and Pontos collections. Visually, the two series don't resemble each other at all; however, the ML112 is used in both of them due to its stopwatch function. In the Pontos series, it's the caliber most often used for that function. This sporty watch has pushers located above and below the crown which control the chronograph, and subdials at twelve and six o'clock display the time. The decentralized seconds is located at nine o'clock. If this layout sounds familiar, it's because the ML112 is a revised Valjoux 7750. The classic caliber from ETA is considered one of the most well-engineered movements and is used by countless watch manufacturers. The Pontos S Diver is powered by an automatic movement without a stopwatch function, the ML115. The main focus of the S Diver is its watertightness. Its case can withstand pressure up to 60 bar, which equates to a depth of 600 m underwater. In this respect, the watch is on par with Omega's Seamaster Planet Ocean. Both watches also feature a helium escape valve. During longer dives, helium atoms can get in through the gasket into the inside of the watch. When the diver begins to surface, the helium atoms can cause excess pressure which damages the watch. The escape valve is most useful for professional divers who dive to deeper depths. The Pontos S Supercharged is also suitable for use underwater and is able to reach a depth of 200 m (20 bar). One defining feature of this watch is the size of its stainless steel case, which appears quite impressive at 48 mm in diameter. Thin hands, stick indices, and Roman numerals define the look of the Eliros collection. The bezel is also very thin, resulting in a streamlined design. The watches are powered by precise quartz movements, which keep the cases thin and ensure the price remains in the upper three-figure range. Like the Masterpiece and Les Classiques collections, the Eliros also features women's watches. The Diaba and Starside collections are available exclusively for women. With a stainless steel case and bracelet, light dial, and blue hands, the Fiaba appeals to women who would also be interested in an Ebel Beluga. The Starside is feminine and fresh, yet also classic with its diamond-studded bezel. The Starside Eternal Moon features a moon phase indicator. While the Fiaba is powered by quartz movements, mechanical movements tick away inside the Starside models. Maurice Lacroix belongs to the Zurich-based Desco Luxury Holding AG, which was founded in 1889 and involved in the Asian silk trade. In 1961, the company bought a business that produced watches for third parties. 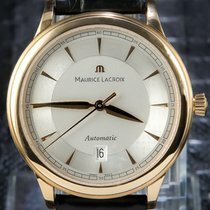 In 1975, they expanded to build a watch division with its own brand, Maurice Lacroix, named in honor of a Desco board member who had recently died. One feature that really defined these watches was their glass, see-through case backs. With this new addition, the young manufacturer continued setting new standards. Nowadays, almost every manufacturer of high-quality watches features see-through case backs so wearers can admire the calibers at work. If you're looking for an introduction to the world of luxury watches, then Maurice Lacroix is definitely on the shortlist. In this regard, they resemble their competitor Raymond Weil, who entered the scene a year later. 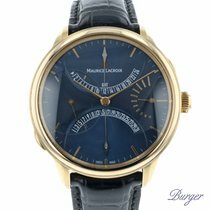 The average price of a Maurice Lacroix lies in the lower four-figure range, although a watch from the Masterpiece collection can reach five figures. That collection, together with Les Classiques, feature watches with elegant to conservative designs and in-house calibers. 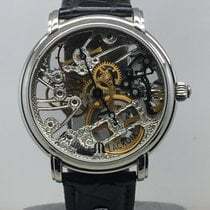 Some watches are even skeletonized. The Pontos attracts sports lovers and divers looking for a functional watch, for example with a black dial or a stopwatch function.